Imagine a shaker table, where kids can assemble a structure out of LEGO bricks and then subject it to a simulated earthquake. The objective is to design the most stable structure. 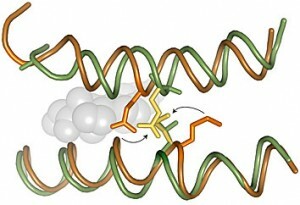 Biochemists face a similar task when they are attempting to design thermostable proteins, with heat analogous to shaking. Thermostable proteins, which do not become unfolded/denatured at high temperatures, are valuable for industrial processes. Now imagine that these stable structures have to also perform a function. This is the two-part challenge of designing thermostable proteins. They have to maintain their physical structure, and continue to perform their function adequately, all at high temperatures. Eric Ortlund and colleagues, working with Eric Gaucher at Georgia Tech*, have a new paper published in Structure, in which they examine different ways to achieve this goal in a component of the protein synthesis machinery, EF-Tu. This protein exists in both mesophilic bacteria, which live at around human body temperature, and thermophilic organisms (think: hot springs). A previous analysis by Gaucher used the ASR technique (ancestral sequence reconstruction) to resurrect ancient, extinct EF-Tus and characterize them. It was shown that that ancestral EF-Tus were thermostable and functional. EF-Tu’s thermostability declined along with the environmental temperature; ancestral bacteria started off living in hot environments and those environments cooled off over millions of years. In the new paper, Ortlund and first author Denise Okafor show that stable proteins generated by protein engineering methods do not always retain their functional capabilities. However, the ASR technique has a unique advantage, Ortlund says. By accounting for the evolutionary history of the protein, it preserves the natural motions required for normal protein function. 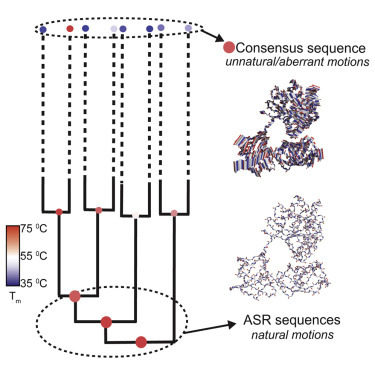 Their results suggest that ASR could be used to engineer thermostability in other proteins besides EF-Tu. *Gaucher recently moved to Georgia State. Prions have a notorious reputation. They cause neurodegenerative disease, namely mad cow/Creutzfeld-Jakob disease. And the way these protein particles propagate – getting other proteins to join the pile – can seem insidious. 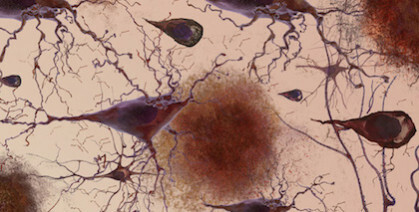 Yet prion formation could represent a protective response to stress, research from Emory University School of Medicine and Georgia Tech suggests. A yeast protein called Lsb2, which can trigger prion formation by other proteins, actually forms a “metastable” prion itself in response to elevated temperatures, the scientists report. The results were published this week in Cell Reports. Higher temperatures cause proteins to unfold; this is a major stress for yeast cells as well as animal cells, and triggers a “heat shock” response. Prion formation could be an attempt by cells to impose order upon an otherwise chaotic jumble of misfolded proteins, the scientists propose. A glowing red clump can be detected in yeast cells containing a Lsb2 prion (left), because Lsb2 is hooked up to a red fluorescent protein. In other cells lacking prion activity (right), the Lsb2 fusion protein is diffuse. “What we found suggests that Lsb2 could be the regulator of a broader prion-forming response to stress,” says Keith Wilkinson, PhD, professor of biochemistry at Emory University School of Medicine. 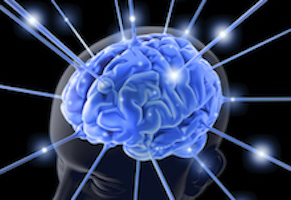 The scientists call the Lsb2 prion metastable because it is maintained in a fraction of cells after they return to normal conditions but is lost in other cells. Lsb2 is a short-lived, unstable protein, and mutations that keep it around longer increase the stability of the prions. The Cell Reports paper was the result of collaboration between Wilkinson, Emory colleague Tatiana Chernova, PhD, assistant professor of biochemistry, and the laboratory of Yury Chernoff, PhD in Georgia Tech’s School of Biological Sciences. Scientists can improve protein-based drugs by reaching into the evolutionary past, a paper published this week in Nature Biotechnology proposes. As a proof of concept for this approach, the research team from Emory, Children’s Healthcare of Atlanta and Georgia Tech showed how “ancestral sequence reconstruction” or ASR can guide engineering of the blood clotting protein known as factor VIII, which is deficient in the inherited disorder hemophilia A. Other common protein-based drugs include monoclonal antibodies, insulin, human growth hormone and white blood cell stimulating factors given to cancer patients. The authors say that ASR-based engineering could be applied to other recombinant proteins produced outside the human body, as well as gene therapy. 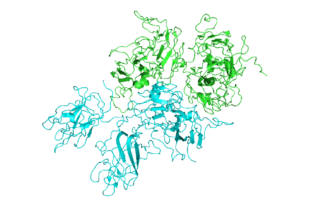 It has been possible to produce human factor VIII in recombinant form since the early 1990s. However, current factor VIII products still have problems: they don’t last long in the blood, they frequently stimulate immune responses in the recipient, and they are difficult and costly to manufacture. Experimental hematologist and gene therapist Chris Doering, PhD and his colleagues already had some success in addressing these challenges by filling in some of the sequence of human factor VIII with the same protein from pigs. Doering is associate professor of pediatrics at Emory University School of Medicine and Aflac Cancer and Blood Disorders Center of Children’s Healthcare of Atlanta. The first author of the paper is former Molecular and Systems Pharmacology graduate student Philip Zakas, PhD. 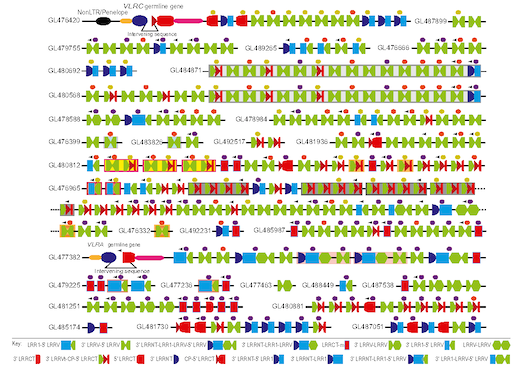 This complex diagram, showing the gene segments that encode lamprey variable lymphocyte receptors, comes from a recent PNAS paper published by Emory’s Max Cooper and his colleagues along with collaborators from Germany led by Thomas Boehm. Lampreys have moleculesÂ that resemble our antibodies in function, but theyÂ look very different at the protein level. 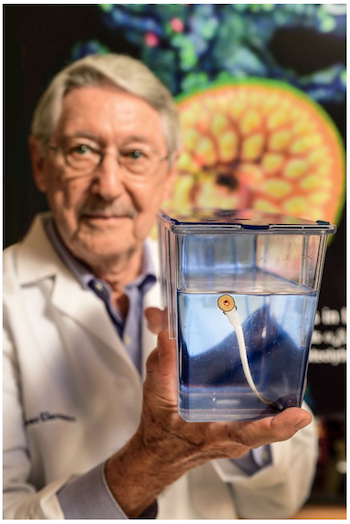 The study of lamprey immunityÂ provides hints to how the vertebrate immune system has evolved. Thanks to prolific UK science writer Ed Yong for picking up on a recent paper in PNAS from Eric Gaucher’s lab at Georgia Tech and Eric Ortlund’s at Emory. The substance responsible for the condition [gout] is uric acid, which is normally expelled by our kidneys, via urine. But if thereâ€™s too much uric acid in our blood, it doesnâ€™t dissolve properly and forms large insoluble crystals that build up in our joints. That explains the http://www.raybani.com/ painful swellings. High levels of uric acid have also been linked to obesity, diabetes, and diseases of the heart, liver and kidneys. Most other mammals donâ€™t have this problem. In their bodies, an enzyme called uricase converts uric acid into other substances that can be more easily excreted. Uricase is an ancient invention, one thatâ€™s shared by bacteria and animals alike. But for some reason, apes have abandoned it. Our uricase gene has mutations that stop us from making the enzyme at all. Itâ€™s a â€œpseudogeneâ€â€”the biological version of a corrupted computer file. And itâ€™s the reason that our blood contains 3 to 10 times more uric acid than that of other mammals, predisposing us to gout. *Ortlund’s former postdoc Michael Murphy was involved in this part. Every time scientists identify genetic risk factors for a human disease or a personality trait, it seems like more weight accumulates on the “nature” side of the grand balance between nature and nurture. That’s why it’s important to remember how much prenatal and childhood experiences such as education, nutrition, environmental exposures and stress influence later development. 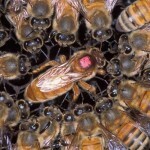 At the Emory/Georgia Tech Predictive Health Symposium in December, biologist Victor Corces outlined this concept using a particularly evocative example: bees. 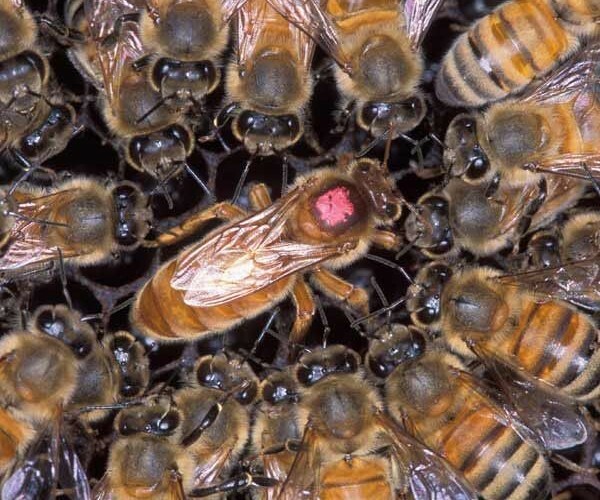 A queen bee and a worker bee share the same DNA, so the only thing that determines whether an insect will become the next queen is whether she consumes royal jelly.